What is a Morticed 3 Lever Sash Lock? A 3 lever sashlock has only 3 internal levers which makes it less secure than it's 5 lever cousins. 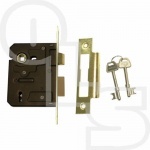 They are suitable for use on internal doors only and offer only basic security. This lock has both a latch, which is operated by a handle, and a bolt, which is operated by a key. Standard 2 Lever for internal door use.